CherrySue, Doin' the Do: Brown Sugar are Chopping for Charity - Come Join the Fun - This Sunday May 19th! Brown Sugar are Chopping for Charity - Come Join the Fun - This Sunday May 19th! It's not often that I'm compelled to share a press release 'just because' but the fact that the super stylish salon Brown Sugar are continuing on in their charity supporting ways with this Sunday's event is too worthy not to share. They open their doors this Sunday 19th May, in aid of the Down Syndrome Dublin and The Mater Foundation Spinal Injuries Unit. Last year’s event managed to raise a much needed €20,000 in aid of St. Francis Hospice, Raheny, which was a huge achievement for all concerned including the beautifully coiffed customers. “We were so overwhelmed with the generosity shown last year, and all the brands that were so happy to show support,” says Brown Sugar MD Mark O’Keeffe of last year’s event. This year’s event will again see the salon opening on a Sunday, and their talented staff will volunteer their time, with every cent being donated to the nominated charities. The event will take place in the South William Street, and Blackrock salons between 12-6pm, so why not book a guilt free appointment as a good deed or as a thoughtful gift for a loved one, or simply pop along to support these worthwhile charities. 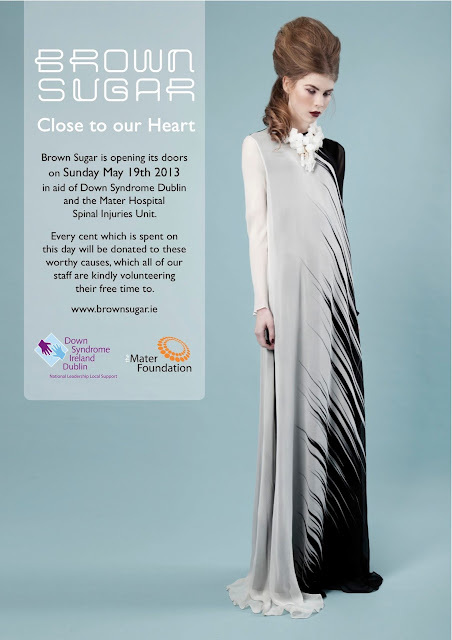 For more information or to book your appointment log onto www.brownsugar.ie.